Certain mission sets, like forest firefighting and Search and Rescue, demand supporting equipment to be rugged, expedient, and persistent with a minimal manpower and supply bill. 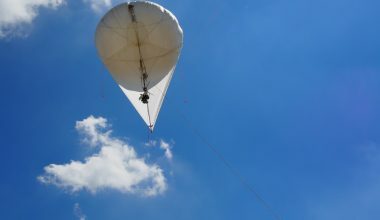 SkySentry’s smallest aerostats—its Tactically Expedient Aerostats (TEAs)–configured for austere environment operations, meet these requirements precisely. Perhaps the overriding advantage of these aerostats is the capability to stay on station for days at a time, with virtually no operator attention. The FrontierSentryTM model is based on TEAs of 15 cubic meters and smaller. The aerostats can operate from an inflatable ground base, trailer, or in some cases, the back of a Utility Terrain Vehicle, and when mounted, can be moved while flying or moored at speeds up to 35 knots, to keep up with transient operations in the most rugged terrain. The FrontierSentryTM is best suited for light-weight radio relays and surveillance cameras in mountainous or desert terrain. Since these integrated systems are specially designed for mountainous terrain, we encourage customers to consider the effects of thin mountain air and hot temperatures on aerostat lift, so a large enough system is acquired to meet lift demands. The FrontierSentryTM consists of two major components, with some variety of each. Extracts tremendous lift from the kite synthesized with the helium balloon. Flies in winds up to 40 knots. 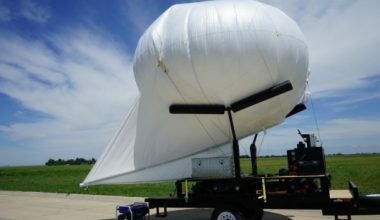 When moored with a fire-sheet cover, the aerostat can typically withstand winds up to 50 knots. Is designed in the basic model to fly up to 750 feet above the ground. Higher flight level options are available. When required, is marked in flight with banners on the tether and aerostat lights at night. Comes with an option for an FAA-compliant, certified, GPS-triggered cutdown device, in case of break away. Generally uses an unpowered tether, which means the aerostat should be retrieved for battery change and inspection about every 48 hours. Powered tether is possible. Generally requires minor helium top off about every 5 days. The FrontierSentryTM can be operated from an inflatable ground base, trailer, truck, UTV or watercraft. Setup can be accomplished by two operators within about an hour. Each mooring option enables retrieval from flight altitude in approximately 20 minutes for battery changes or maintenance. Each mooring option allows launch and recovery with 12 VDC batteries, or for somewhat more cost, with a compact, highly reliable DC electric winch, powered by an ultra-reliable Honda 120VAC generator through a converter. The synthetic tether is unpowered, with a 2,000 KG breaking strength and weighing about 5 KG per 1,000 feet. Customers should plan for payloads to come with their own battery power. Multiple units of the FrontierSentryTM are easily transported by C-130 size aircraft or by sea with standard ISO container. In all cases, a purchase provides a turn-key setup, including power, helium, tether, winch, tools, repair kit, and protective covers. Complete training, tools, and spares packages, as well as on-call technical support or full-time SkySentry operator crews, are options for customer consideration. Please contact SkySentry for more information and pricing to fit your own custom needs. Integrated Surveillance & Communications - Imagine putting a cell tower at 500 feet above the ground in less than an hour!